You can have a loading dock anyplace you need one, as long as the roadway surface will support the Dock-Lift base without deflecting. There is NO pit required. Standard models are available with capacities up to 5,000 lbs., adequate to accommodate hand carts, 4-wheel carts and pallet trucks. Heavier capacities are available for special applications. Surface-Mount Dock-Lifts are equipped with optional flip-down wheels for easy transportability to new locations, using a removable dolly handle. 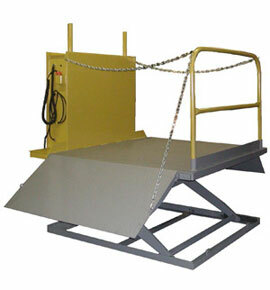 Special bridge and ramp plates are available to adapt the Dock-Lift to your application. The approach ramp and end-rails can be factorylocated to accommodate right-angle loading. The 42" high handrail is removable for awkward loads. The standard self-contained, on-board power unit is designed for operation on 110/220 volt, 1-phase, 60 Hz power so that you can use the Dock-Lift anywhere. Other power options are available.